Jimmy Sandral occasionally casts his mind back to that late-September day in 1956. 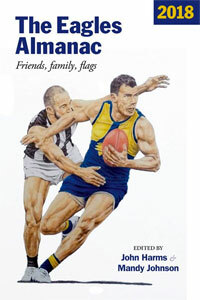 A record crowd of 115,802 has jammed into the MCG for the Grand Final, between arch rivals Melbourne and Collingwood… He runs, or rather, floats, onto the ground behind Demon skipper Noel McMahon, and alongside such luminaries as Ian Ridley, Bob Johnson, Stuart Spencer, Donny Williams and Ron Barassi. Seven years earlier, Jim had just settled back on the family farm after completing his secondary education. 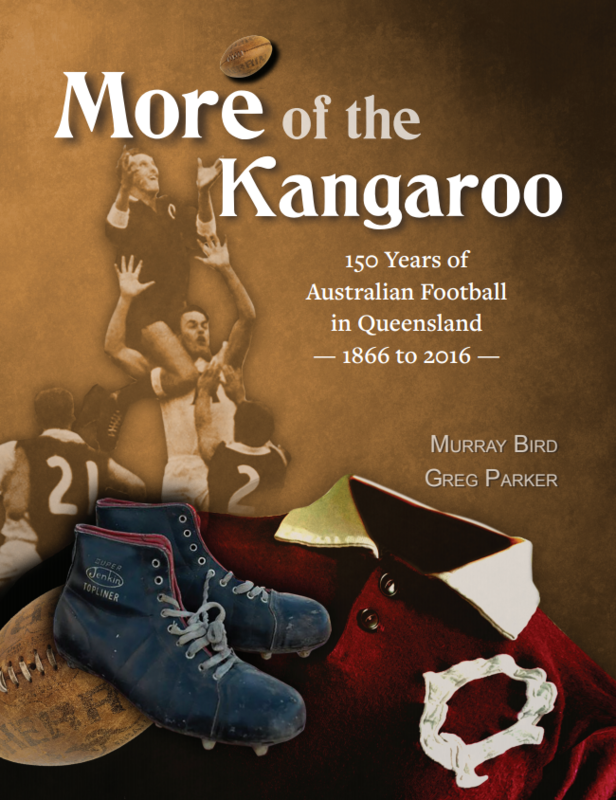 He had to re-acquaint himself with the rudiments of footy, as he’d been boarding at St.Gregory’s College, Campbelltown, a traditional Rugby League stamping-ground. Before his departure, he’d attended the local 11-pupil State school. With seven girls and just four boys, ‘Rounders’ had been the compulsory sport at Rennie Primary. So when he debuted for Rennie, aged 16, in his first-ever fair dinkum game of football, he was, he admits, pretty rough around the edges. “I wasn’t even sure of the rules. I must admit I made plenty of mistakes,” he says. But he cottoned on pretty quickly. In 1952 he won the club Best and Fairest award, was runner-up in the League Medal and played a starring role in Rennie’s premiership side. Jim Sandral as a youngster. In the following two years he won both the club B&F and the Coreen League’s Archie Dennis Medal. It was late 1954 when Corowa invited him in to play a couple of late-season games on match permits. Jimmy adapted easily to the lift in standard and was persuaded to make the 25-mile trek in from the farm, to join the Spiders in 1955. He was a natural, and took on all-comers at centre half-back. Standing just under 6 foot, and weighing around 14 stone, he possessed a strong pair of hands. 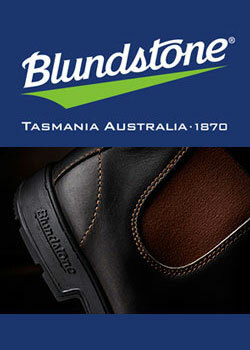 And – when he swept onto that left boot of his – he could hoof the Sherrin a country mile. After just seven games with Corowa, Jim earned selection in the O&M’s Country Championship team. In what was an All-Star line-up, he was the stand-out, polling eight votes of a possible nine, to win the gong as Player of the three-game Series. Jim made the O&M League Team just before heading south. 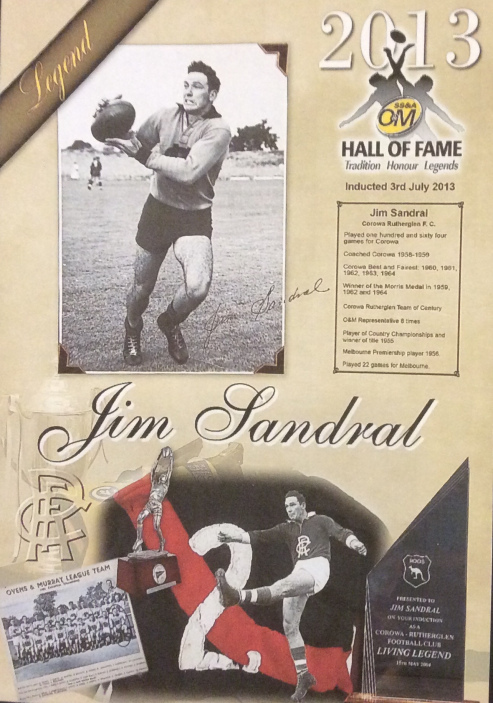 But when persuasive Melbourne secretary Jim Cardwell and recruiting manager Ken Carlon (an ex-Demon 49-gamer and former Rennie coach) paid a visit to the Sandral property later that year, Jim was invited to be a guest of the club at the 1955 Grand Final. I ask Jimmy if Smith was as tough as they say. “No doubt about that,” he says, as he recalls an incident at training one night. 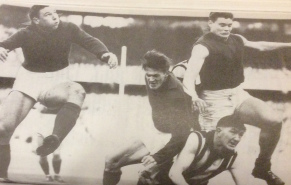 Jim played alongside VFL/AFL legend, Ron Barassi. 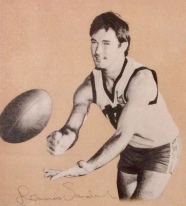 It was no mean feat for Sandral to break into a Premiership team, and hold his place in his debut season. His form wavered a little at times, and he was named on the bench for the Second Semi-Final. The Demons stormed to the flag a fortnight later, winning by 73 points, after Collingwood had held a 5-point lead at quarter-time. 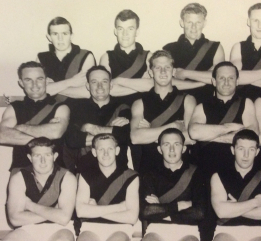 The 1956 Melbourne team is still thrown up as one of the greatest of all-time. An ankle injury kept him out for a fair portion of the following season. Add that to a decent bout of homesickness and it’s not hard to understand why the wide open spaces of Rennie beckoned. Corowa jumped in and appointed him playing-coach in 1958. They were light on for personnel, but were inspired by their champion centre half-back, who took out his first Morris Medal the following year. The Spiders were a vastly-improved combination in the early sixties, and surged up the ladder. Tuck had a terrific lieutenant in the dynamic Sandral, who was to take out five successive Club B&Fs and add another two Morris Medals to his collection. He finished fifth in the Medal on another two occasions. 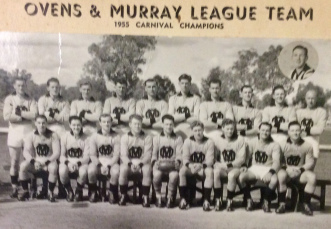 Corowa won their way into their second-ever Grand Final in 1963, with tight 10 and 7 point victories in the lead-up. Sandral’s battle with burly Demon forward Ian Hughes was to prove one of the highlights of the game. His side was in the contest up to its ears at three quarter-time, but Benalla blew them away with an eight goal to nil last quarter. The Spiders would have to wait another five years for their fairytale flag. Back at Corowa, on the hunt for an elusive premiership. By this time, Jimmy Sandral was back at Rennie. He had left Corowa, aged 32, after 164 games, and a reputation as the greatest-ever player to wear the Black and Red guernsey. 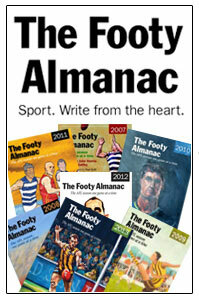 For the next six seasons he coached his home club, and finished runner-up in the Archie Dennis Medal each time. Dennis Sandral, son of Jim and fellow Hall of Famer. Seven years after Jim’s retirement, his son Dennis began a football journey which saw him chalk up 348 O&M games. Regarded as the finest defender in the competition in his day, he and Jim were named full back and centre half-back respectively, in Corowa-Rutherglen’s Team of the Century. He also matched his dad’s feat of winning five club Best and Fairests. “But then, the other boys were handy, too. Michael did his knee early on, and young Jimmy had a bit of back trouble. When Dennis coached Howlong, Jimmy followed him out and won the League Medal. Jim and Shirley also had two daughters, Bernadette (O’Donnell) and Joanne (Reagan). 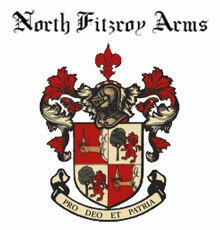 There are also 17 grandkids and eight (soon to be 12) great-grandkids, so the Sandral footy dynasty is set to continue. 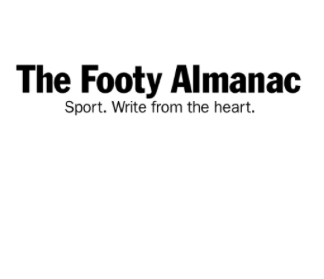 Jimmy’s going on 86 now, and there’s no more respected figure in footy. This official Legend of the Ovens and Murray League could also be dubbed its unofficial Ambassador. Jim’s Hall of Fame induction in 2013. KB’s original article can be read here along with other fine works at his site, “On Reflection” here.